Sometimes we all need a little help in the gym, and a workout partner allows you to reach levels of intensity that may not be achievable on your own. Who better to motivate and inspire you than your significant other? If your partner in the gym also happens to be your partner in life, you will not only strengthen your body but also the bond you share. Some of you may think you would never workout with your significant other, but there are many benefits. Having a workout partner allows you to push yourself harder without the risk of failing and injuring yourself. There are also many techniques you can apply with a partner that help you increase your workout intensity and build more muscle. You get to spend quality time together. How many times have you heard “we never do anything together!” The gym can be an event for the fitness minded couple. You can warm up together and help each other stretch. You could foam roll each other's tight muscles. Foam rolling can be painful and is excellent (and cheaper than professional) couples therapy. After a workout, you can cool down at the pool or jacuzzi if your gym happens to have one or go somewhere nearby for a healthy post workout snack. You have someone watching your form and preventing compensations from occurring. Your significant other knows you better than anyone else. They can motivate you differently or help you work through mental blocks negatively impacting your workout. You will be held more accountable for your workouts. It’s much easier to blow off a workout when it’s with a casual gym buddy than your significant other! Your relationship will likely improve. It’s similar in the way teammates bond through the sweat and hard work they put in while pushing through previous limitations. Working out releases all kinds of endorphins on its own and through the support you provide each other your relationship becomes stronger. 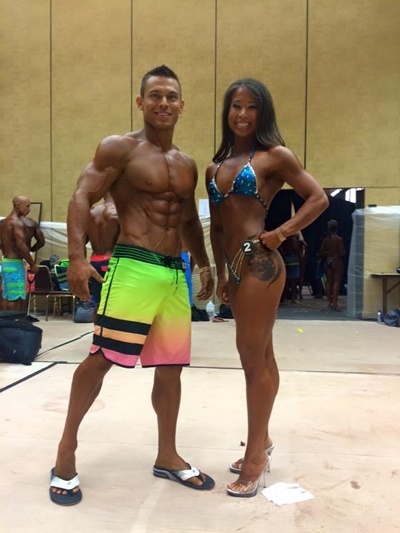 If you ever decide to step on stage and compete then going through it with your significant other enables a deeper level of understanding of each other and what it takes to get into competition shape. You won’t have to apologize for the lack of energy or hangry outbursts because they understand what you’re going through. Having a workout partner allows you to break through and prevent plateaus in a way you can’t do on your own. There are a number of techniques you can perform increasing muscle growth and the intensity of your workout. Since these techniques are designed to push your body past failure and drain every last ounce of effort, you are going to need the right supplements to keep the intensity level high. Creatine allows you to pump one more rep by increasing the efficiency of your ATP energy system. Pre workout is also a good addition because on top of the increased pumps and blood flow it also contains ingredients designed to put you in the right state of mind by increasing energy and focus. Now you’re ready to give some of these techniques a shot and kick your workout up a notch. This is a very common technique seen in most gyms. Although you don’t want to do it for every single set, going past failure forces your body into change and out of its comfort zone. Start by using a weight you know you can only perform 3-6 reps with good form. Once you are at failure, your workout partner begins helping you complete the concentric portion of the lift. You must still control the eccentric portion on your own, but your partner will give you just enough help to finish another 1-3 repetitions. A strip set, also known as a drop, is another common technique used. It consists of choosing a weight at which you can only achieve 4-8 repetitions and then once failure is reached, the amount of weight is lowered (typically by 10-30%) and doing another set of 4-8 repetitions. Repeat this process if desired. For example: Say your max bench press is 250 lbs for 5 repetitions. You could do one set of 250 lbs x 5, then drop the weight to 220 lbs x5 and then maybe one more set of 5 at 190 lbs if you really want to push your limits. Having a partner (or even two) to help strip the weight quickly allows you to spend less time recovering and changing weights and more time working. This technique is for advanced lifters only and should be used sparingly. If you have a stubborn or lagging body part, this is a great way to force change and get out of your comfort zone. When performing a forced negative, execute the concentric portion of the lift, and then try to hold that end range. Your partner then “forces” the negative portion of the exercise while you try to fight that resistance. Take about 4 seconds to complete the eccentric portion, fighting it the whole way. Preacher curls for your biceps are an excellent exercise to practice forced negatives. When you reach the top range of motion, try to keep the bar up close to your chin and pull against the force your partner is applying downward. Perform eight or so reps of this and you will feel a pump in your arms like never before. There are three types of contractions. Isometric, concentric, and eccentric. The eccentric portion is the strongest, you can typically handle about 60% more of a maximum load vs. the concentric portion of the lift. A good way to fully tax the muscle is to use a weight where you can only perform 1-3 reps. Once you hit failure, your partner helps you with the concentric portion of the lift (like the pressing part of a bench press) while you focus all your energy on the negative (lowering portion), Perform another 4-6 reps this way with your partner applying as much assistance as needed. You want to almost completely remove the concentric portion and only focus on the 2-4 seconds of eccentric contraction. This is essentially the opposite of an eccentric only. Your partner will assist with the eccentric portion, and you are trying to save all your output for the concentric contraction. This can be difficult for some compound exercises, but many machines make it easy to accomplish. An isometric contraction at the end of a set can really help create some growth and facilitate more of a mind muscle connection. At the end of a set have your partner meet you halfway through the exercise with an equal amount of resistance in the opposite direction. Perform 1-3 isometric reps at the end of a normal set. For example at the end of a set of military presses your partner would push down on your hands at the halfway point for 5-10 seconds, adjusting the amount of pressure as needed to maintain an equal amount of force. Try to combine techniques to supercharge your workout. You could do a drop set and then finish with forced reps. Another combination could start with forced negatives, then a drop set, then finishing with a couple isometric contractions. Use your imagination and get creative but don’t go overboard and do it every set of your workout. But if you feel up for it combine a few techniques together to increase your intensity level. If you are looking to shed some fat then limit the intensity techniques to only a few sets per workout. Since you will need to be in a caloric deficit, you will not have the energy reserves required for much volume with this type of training. Also, if cutting, make sure to include some BCAAs to ensure you preserve your lean muscle during these intense workouts. Even if your partner is your significant other don’t be afraid to push them and raise the level of intensity of the workout. The mental aspect of training is huge and if you engage in small talk about weekend shopping plans you may not be able to summon the right kind of energy and mindset to reach new PR’s. Try to keep the focus on the actual workout. By helping your significant other achieve their goals and reach new heights, your relationship will be strengthened as well. The time you spend with your significant other is going to have a very large impact on the quality of your relationship. If you spend some of that time breaking through barriers and empowering each other you gain a greater understanding and appreciation for each other. Going to the gym together is a great way to accomplish this and to take steps together in a direction for better health.Your fitness journey can be greatly aided with a strong support system so get in the gym with your significant other and let the sweating and grunting commence!